I don't know about the new LinkedIn changes. I'm generally fairly relaxed on changes and updates, whether I personally like them or not - I assume the user data has lead them to this or that update, and most of the time they end up providing a better experience. 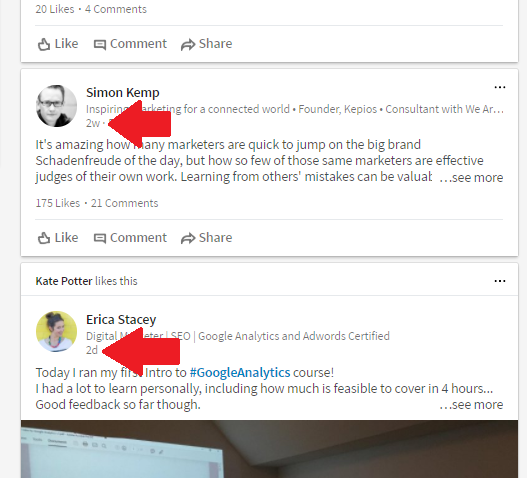 On LinkedIn, however - which, it's worth noting, I primarily use on desktop during the day - their latest updates, particularly with their feed algorithm, seem to have been a bit of a step back. Take this, for example - scrolling through my LinkedIn feed right now, these are the sixth and seventh stories listed. As you can see, the lower one is from two days ago, but the upper one, from Simon Kemp, is two weeks old. Granted, the post has generated a lot of engagement, which is no doubt why I'm seeing it, but I log onto LinkedIn every day, it's not like I need the algorithm to uncover older items for me - especially content from weeks ago. 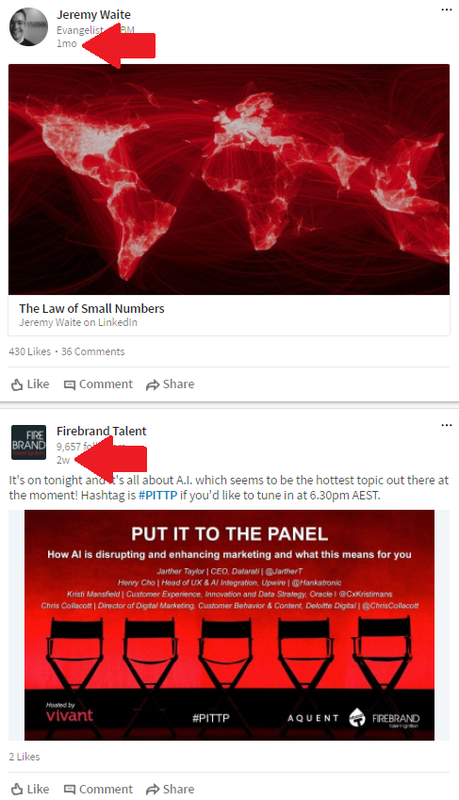 The top item is a month old (though it has generated a lot of response), but the lower one is not only two weeks old, but it's for an event which happened on the evening of the day it was posted, meaning it no longer bears any relevance. And what's more, the engagement on the post is minimal (2 likes). LinkedIn's algorithm has always been somewhat more liberal than other platforms in this regard, but it seems to have gotten worse since the recent change, and others have reported experiencing the same. But now LinkedIn has provided an answer - kind of. 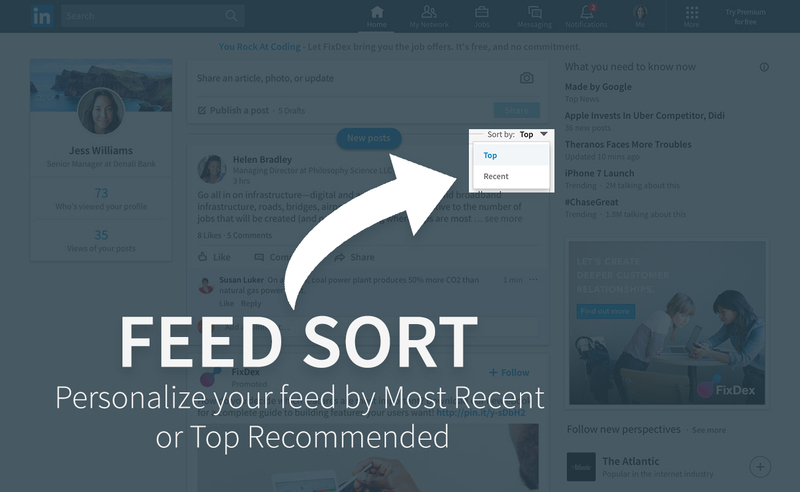 In a new post, LinkedIn has outlined some of the more recent, smaller changes they've made to help improve the user experience, the first of which being the re-introduction of the option to sort your list by recency, as opposed to being left with the algorithm defined 'top stories' feed. The option is not available to all users as yet, but is in the process of being rolled out, and should help alleviate some of the issues with the current LinkedIn feed. In addition to this, LinkedIn's also provided some new tips on how to personalize your feed by following the most relevant industry sources. "Looking to follow the top voices in marketing or big data? We've got you covered. Click on on the control icon on the top right corner of any update and choose "Improve my feed" to follow industry leaders, companies and publications." And with the emphasis on messaging growing - LinkedIn's seen 240% growth in messages sent, with more than half of their members now interacting with messages on a weekly basis - LinkedIn's also adding message receipts, with a profile bubble appearing when your recipient has seen your LinkedIn message. You can switch message receipts on or off in the 'Communications' section of your settings. These are some good, helpful updates from LinkedIn - small refinements, but they all work to improve the user experience and better customize your preferences to your requirements. As noted, LinkedIn still seems to have a way to go in refining the details of their feed algorithm, but they are working with their data and looking to create better systems to drive engagement. And given the amount of data resources LinkedIn has, this can only be beneficial in the long term.